As a developer building a website, you might be tempted to dive straight into the code and get the creative side of things rolling. But before you do, it’s important to go through the less exciting steps first, to make sure your site is set up correctly. Here is an essential guide to the admin behind building your first website. Blog: A blog can be a standalone website, or an extra feature for a larger website. Blogs are usually arranged in chronological order, with the most recent entry at the top of the main page. E-commerce site: Showcases products or services, and allows visitors to purchase them online. Business card site: A simple one-page website for a small business. The site typically includes the name, description, contact information and company logo. Portfolio site: Similar to business card website, but with an additional section that showcases a portfolio of work. This format is typically used by design companies, photography studios and other creative businesses. Product brochure site: A more detailed site used to market a business. This site setup allows visitors to browse through the goods and services offered by the company. It may include some pricing guidelines, but unlike an e-commerce site, a product brochure site doesn’t enable customers to make purchases online. There are many different site-building platforms and tools available to choose from. Certain platforms are better suited to specific site types, so defining the purpose of your website will help you choose the right platform. 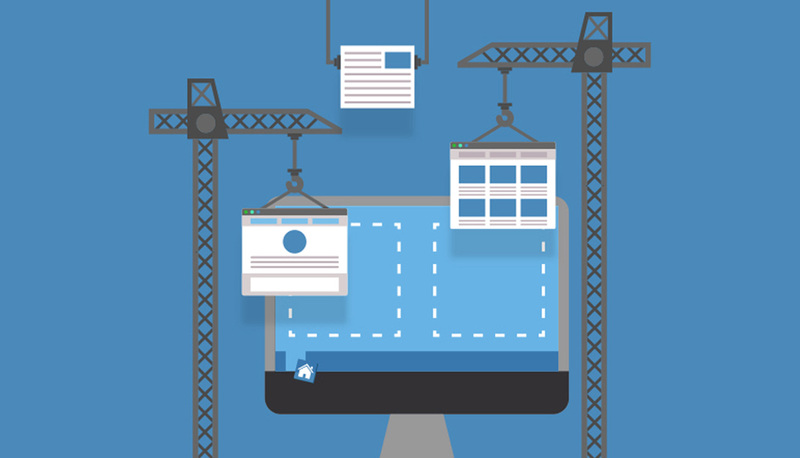 A platform (also called a Content Management System or CMS) is the “skeleton” of your website. This is where you make changes and additions to the site. The right platform will make it easy to maintain and update your site regularly. There are two main types of CMS: hosted and self-hosted. A hosted platform gives you a quick, easy way to start publishing content without touching a server or managing upgrades. However, hosted platforms are more limited when it comes to what you can change. A self-hosted platform gives you more accessibility, with free reign to customise the functions and style of your website. WordPress is widely considered the easiest platform to use, and is therefore ideal if you’re building your first website. The next step in building a website is choosing the right name and web hosting provider. Ideally your domain name should be something like yourname.com or companyname.com. You will need to find which domain names are available, and reserve the one you want. This domain identifies your site and gives you administrative control of it in the online sphere. The web hosting provider is where your files are stored online. The purpose of your hosting provider is to make sure your domain is available to potential viewers at all times. A reliable host means good website functionality and performance. Compare the top web hosting services of 2018 to decide which one best suits your needs. SSL stands for Secure Socket Layer, which is a standard security technology used to set up an encrypted link between a server and a client (such as a web server and a browser). A secure certificate is a document used to certify that an individual or business is who they say they are. It lists details like the official company name, the full web domain name, creation date and expiration date. Your certificate will transmit data on the Secure Socket Layer, which encrypts the data to protect you against identity theft and credit card fraud. This step will vary depending on which CMS you’ve chosen. Install your selected content management system (e.g. WordPress), following the prescribed steps for that CMS. The it’s time for the creative stuff to start! This is the part you’ve been waiting for – the actual code and design that goes into building a website. When a visitor lands on your site, it will take them less than three seconds to decide whether to stay or move on. You need good, clean design and functionality to keep their attention. Once the design is complete, add the written information (content) that needs to appear on your site. It’s important to make sure your content is useful, unique and updated regularly. Clear, well-written content ensures your visitors can easily understand your marketing message. Search engines also reward sites with quality content, with higher rankings. After all the time and effort that goes into building a website, you’ll undoubtedly be eager to launch it. But there’s one more crucial step you need to take before going live. Test, test and test again! Launching a site with numerous errors will reflect poorly on the company, and on you as a developer. Be sure everything is in good working order before the site becomes available to the public. Looking to build websites professionally, but not sure where to start? Take an online coding bootcamp and find out exactly what’s involved in coding, designing and building a top-notch website.